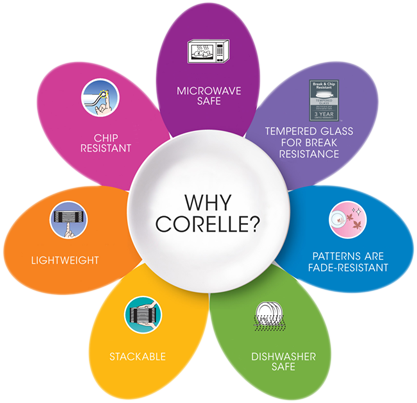 REVOLUTIONARY MATERIAL - Corelle’s durability is due to its unique sandwich construction which bonds together three layers of special glass materials. The result is lightweight dinnerware that resists breaking, cracking, chipping, scratching and permanent staining. THIN AND LIGHTWEIGHT - Wafer thin and easy to store, Corelle is designed for easy handling and compact storage. It is ideal for kitchens with space constraints. HYGENIC - Its non-porous glass surface doesn’t retain food odours and particles, doesn’t stain and is easy to wash.
DISHWASHER AND MICROWAVE SAFE - Corelle is adaptable to all modern appliances like the microwave oven and dishwasher, thus shortens your preparation, cooking and washing time. ATTRACTIVE SHAPES AND DESIGNS - A wide selection of attractive patterns and shapes from traditional to contemporary to express your personal style as well as all dinning occasions. This is a Corelle Placemat from the Garden Country Cottage set. The intricate appealing tableware offers a contemporary look that's simple, yet elegant and coordinates with a range of home décor styles.Corelle brings beauty and durability to your table every day.